I can’t shake the images, even 5 days past, of last weekend’s Silent film fest premier of Napoleon: the visual profile of an emperor; the imposing black, French commander’s hat; those intense blue (?) eyes deeply contrasted in black-and-white in both the child and the man; his unflappable presence; the women and clothes; that long nose that seemed to grow more distinguished with each country overtaken… 😉 It was all unforgettable. The San Francisco Silent Film Fest kicked off last weekend here in Oakland, with the US premier of Napoleon, showing at the Paramount theater. 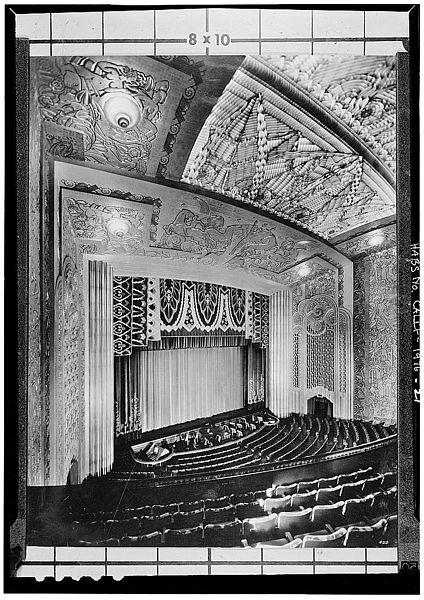 I’m not sure what of those 3 morsels was more exciting!- that Oakland is the premier US city; seeing the 1927 version newly restored (by Kevin Brownlow, Francis Ford Coppola, Zoetrope & others); or going to the opulent Paramount Theatre. Add to this Carl Davis in the pit, conducting the Oakland East Bay Symphony performing his own original score. He last conducted this in London, 1981, to Francis Ford Coppola’s shorter version. If you are anywhere close, you must go; there are only 4 US dates, the last 2 are this weekend in Oakland- 3/31 & 4/1. This is truly rare and once-in-a-lifetime. It is interesting to read/hear how many film directors say that this film changed their lives. Yes, it is long. But the full 8 hours has been restored down to 5. And I can’t believe how quickly it went by, perhaps due to 3 intermissions and a long dinner break. This is a perfect date event that you will remember. But with so many silent film lovers in this crowd of almost 3,000, even if you come alone- you will be steeped in the excitement. I recommend making dinner reservations somewhere nearby (Mama’s Vietnamese on 19th is fast and yummy). And if cost is a factor- ask about obstructed view seats on the first balcony; they didn’t look too bad from a distance. But know, this show is worth the splurge. For me, this version was fascinating in its 1920’s romantic view of an emperor; enlightening in telling a history I wasn’t taught; powerful in showing a genius military strategist with an iron will, and; gorgeous, showing the timeless beauty of the woman in his life, with a breathtaking 1920’s Parisian party life scene. I’m not sure why there are no other US dates- except for cost. Here is a sneak peek. Here are SF Gate details on why the film and showing are so rare, and below- see/hear director Kevin Brownlow on the restoration. I’ll post more pics from the Paramount’s interior next.